Problems on Section I became apparent within months of work starting. The Clydach Gorge was not an easy place to build a road in the first place, but it was beginning to look like John Morgan's company were not quite up to the task of building it at all, and as the work went on, they were beset by one unfortunate event after another. In February 1961 — halfway through what was meant to be a two-year project — they were being granted their second extension of time, and the completion date would be set back another three times before the work was done. By September 1961, the contract was in serious trouble. Bad weather had delayed works considerably, and poor planning had resulted in further delays. Rates of pay for skilled labourers had gone up unexpectedly steeply, and a shortage of carpenters and steelworkers in Wales meant that the company was either short of staff or paying over the odds. But the real problem was that John Morgan's company had grossly underestimated the cost of the job in order to get the contract because they were so desperate to get into lucrative road construction work. Having charged too little, and paid out too much, they were now struggling to make ends meet, and declared an end to overtime and other financial incentives to staff. That meant fewer workers on site and a slower pace of work, and the completion date was set back by another full year to Christmas 1963. Over the following months, steeply rising costs for raw materials of all kinds caused more financial problems. The Ministry reluctantly agreed to revise the contract cost based on the new prices, and paid out an extra £240,000. And then the real problems started. Construction work on the new bridge over the Usk, the biggest structure in Section I, had to be aborted and new designs drawn up when it was found that its eastern end was situated on a rock fault that wouldn't support the bridge's weight. The abutment had to be built further back, requiring a longer eastern span and changes to the structural design. The delay cost more money and more time. Then, in October 1962, the embankment at Blackrock Lime Works slipped, with tons of earth cascading down onto the worksite, and all work had to be halted. It took four months to devise a way of supporting the embankment safely. But the severe winter stopped all work, delaying the fix, and while the site was empty the face of a rock cutting next to the Clydach Gorge Viaduct collapsed. Heavy rock falls tumbled into the gorge, damaging the unsurfaced road bed. When work could finally resume, it took until August 1963 to fix the Lime Works embankment. On the rock fall, work was completely suspended until July. 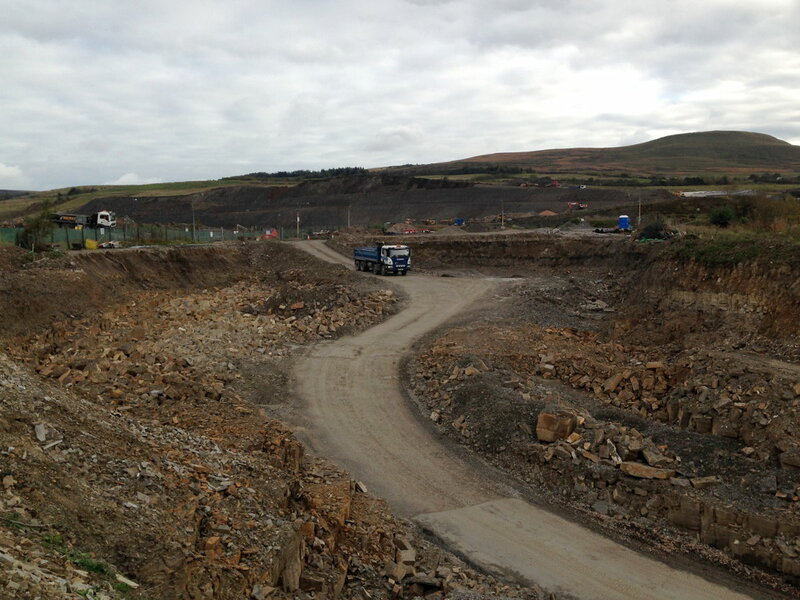 The steep rock face had to be cut back to a shallower angle — which meant not just rebuilding the cutting, but also most of Brynmawr Sewage Works, whose vast filter beds were at the top. Together, this accounted for a further six months' delay. All this extra work had to be carried out at the original contractual rates — agreed in 1960, when prices were much lower. John Morgan's company was already running a loss of half a million pounds on the contract, and estimated that the extra work to fix the two landslips (and the unexpected foray into sewage works reconstruction) would put them at least another £100,000 into the red. At the limit of their overdraft and with no further income on the horizon, they weren't even sure they would stay in business long enough to finish the work. In the end an arrangement was reached where the Ministry paid an advance of £10,000 to Morgan each month, which would be deducted from the money remaining to be paid to them on completion of the works. It was just enough to keep them afloat. John Morgan's workmen struggled on. 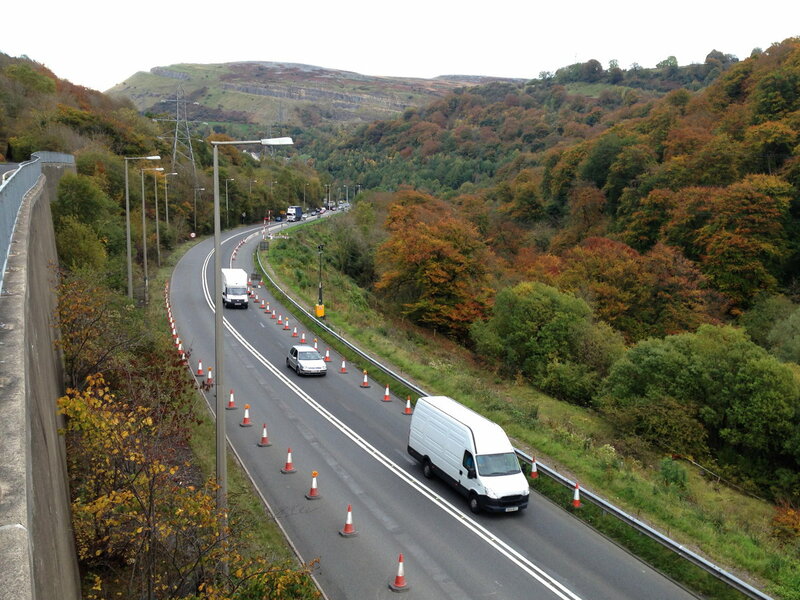 To the west, the Hirwaun Bypass, at the far end of Section II, opened to traffic in July 1964, and still the road up Clydach Gorge wasn't complete. Eventually, in September 1964, almost five years after work began, the Ministry of Transport wearily handed Morgan a certificate of completion and allowed them to vacate the site — and even then, one lane of the new road through the Gorge remained closed to traffic because the finishing works were incomplete. Perhaps it was best for everybody if the sorry business was just brought to a close as soon as possible.